Deadman mode has returned to RSCR, this game mode is similar to the Deadman mode found on OSRS, where players play in a full world PvP environment. Deadmen won't be playing on a separate world, they will be playing along with regular players. Deadmen are a new character type just like iron-men or veteran mode. 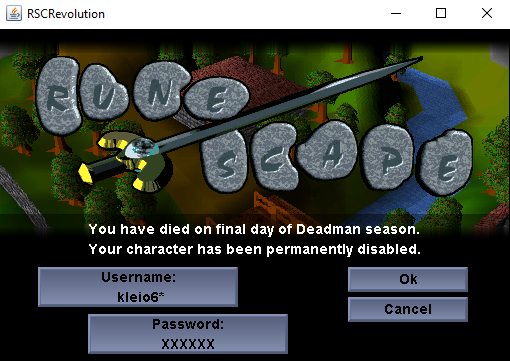 Deadman mode will be available for two weeks, till Sunday 26th this month, exact time and scenario for the end game will be posted later in a separate post. This season, DMM players will be required to be completely self sufficient, at the bottom of the post there is a list of rules that Deadmen must follow. Please read them and if you believe that you won't be able to follow them, do not play DMM and risk getting banned. - Characters will have a combat level cap of 80, any character build is possible, but combat xp gain will stop when combat level of 80 is reached. - Teleporting and logging out requires you to stand still for 10 seconds. - Lowe's Archery Store will have 600 bronze arrows and 450 bolts in stock. Experience rate for rebuilding lost experience: 2x the above. Subscriptions can be given to DMM chars by using the subscription card on your DMM character. Cards can also be transferred to DMM chars with staff help, if Kleio or Billy are online, please PM them directly on Discord. - You will lose smaller percentage from 10 most valuable stacks in your bank to Bank Raid Chest. (Higher level opponent -> smaller percentage). - You will lose smaller percentage of all unprotected stats (Higher level opponent -> Smaller percentage). - You will lose all items from your inventory and equipment. - You keep 3 most valuable items. - You don't lose any bank items. - You don't lose any experience. - Your experience rate for that skill is doubled until you reach the experience you once had. If you manage to kill a player in Deadman Mode, you will receive a Deadman Key. This key will give you access to chest which contains percentage of 10 most valuable stacks from opponents bank. - You can only hold maximum of five keys at a time, if you have five keys and kill someone, key will not be dropped. Deadmen have an option to keep their most valuable items safe using a safety deposit box which can hold up to 10 items, not stacks. The box can be accessed through Bankers. Hitpoints are auto-calculated on death. You can protect your stats by opening stat menu and right clicking the stat you want to protect, and selecting "Protect <stat>". - Skull default time is 15 minutes, maximum skull time 30 minutes. - Each time you attack a player while you are skulled, your skull timer is reset and your skull time is extended by two minutes. - If you attack player 30 or more levels below you, your skull time is set to 30 minutes. - Your skull timer does not tick down if you stand still. You have to be on the move to lose your skull. - Players who attack you when you are skulled will not get skulled themselves. - Safe zones have high level guards, which attack skulled players trying to enter it. Each time you kill a player, your kill-streak increases. This is indicated by your skull color changing. Additionally, the amount of Deadman Keys you hold in your inventory is indicated above skull by key icons. - Deadman Characters will have their name drawn in blood red, in chat and above head. - Attack option is only shown on deadman players. - Timer is reset to 20 seconds on any damage from your opponent. - You cannot attack anyone else but the person attacking you. - Can't add new listings to Auction House if there are unclaimed expired auctions. Safe zones will have high level guards, which will attack any players with a skull and, highly likely, kill them. The last day of this season Sunday 26th will be the last day you will be able to use these characters as Deadmen. If you die on the last day, between Sunday 26th 0:00-23:59 PST, your character will be banned until the end of the season. On Monday DMM s2 characters will be converted to normal characters following an XP reduction. You will not be able to use them in season 3. -1st place: $100 usd, 5 gold subs, 5 platinum subs. Deadman Champion forum pip with 2h. Honorable mentions: People who didn't die on the last day, highest accumulation of specific items, etc. Note: All eligible champions will have their accounts vetted, people who used rulebreaking advantages will be disqualified. - Trying to gain any wealth in a way that obviously show an attempt to transfer items between chars will be taken as a bannable offense as well. If there are any questionable situations, staff reserves the right to discuss the situation internally and take appropriate action against offenders. 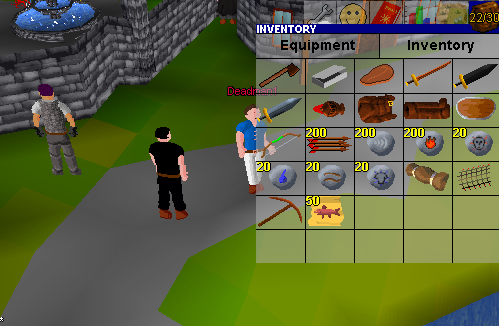 If you find that being self sufficient is not your cup of tea, please do not complain or play DMM trying to break the rules, just skip this particular activity and enjoy the regular game mode. There will be other DMM seasons in the future and the rules may be different, but for this event, these are the rules. Breaking of any DMM rules will result in a ban of all parties involved, ban will count as a ban on regular game mode and may move you towards a list ban if you've been banned in the past. Final day of the Deadman Mode has started, death of Deadman mode characters is now permanent, if you die, the season will be over for you. Deadman season will end when the counter posted below ends at midnight PST. Prize and best performers will be announced sometime on monday, since just being the number one in statistics won't be enough, we will be checking for any form of rule breaking first. When you die, you will be automatically kicked and you won't be able to login back into the account. Last couple weeks RSCR community was able to enjoy our unique Deadman mode. Over the two week period 399 Deadman characters have been made and we hope you've had an interesting experience! Deadman will definitely return to RSCR in the future, but right now we need to celebrate the best performing players this season. 3) Terp Doctor with 22 keys; 1163 casts with 726 being on point, 184 successful and 95 failed catches. Congratulations to the winners! As previously mentioned, all winners and participants of the season will get a forum pip that will be added to our forums soon! 3) Lostmycandy with 156210 tiles. 3) Pizzaboy62 with 346309 gp. 3) Dm tjd with 744 runes. 3) Dm tjd with 537 swordies. What other statistics you'd like to see now and in future seasons? Post your request below and we might add it. Winners of the skiller and pker competition, please PM Kleio on Discord for prizes. At the moment the Deadman Mode is in final stage of development and a test server will be hosted within a day or two, players will be invited to check out the latest features and make sure everything is working to players liking. Client download for the test server will be made public for everyone. When testing is complete we will be hosing a two week Deadman mode season, the prizes and DMM achievement goals will be announced when date for season start will be set. This post is an introduction to the upcoming season features and spark final discussions in the community. no trading means i couldnt say, fish on one acc and trade them over to another acc? and if so, would selling them 1gp each in ah and rebuy them on my other acc get me banned for trading? is there a maximum account limit? No account trading is a +1 from me, gives android players such as myself a fair chance of competing. Won't people just bypass this though by killing their alts? I will have to check this out for sure. Sounds exciting. Check out my Skills I offer FREE! I'm super excited for this to rejuvenate my love for rsc. Great work kleio!!!! Honestly not gonna lie, the fact you implemented this into runescape classic blows my mind. Honestly amazing I might give it a try, I am not a big fan of deadman mode cause I am bad at pking but I might pop on . Epic. Nice work team, I'll be giving this a go for sure. - Trying to gain any wealth in a way that obviously show an attempt to transfer items between chars will be taken as a bannable offense as well. "is there a maximum account limit?" - no account limit. Deadmen MUST be self sufficient. Any idea of launch? Great work team. forced to quest for rune long, or get 99 smithing on 2x xp in under 2 weeks mining all ores alone, impossible unless u play 20 hrs a day ?? I thought some npcs were being added outside wild for this. all skillers just keep there rune/best gear in safe deposit while they skill and lose 0 stats? 5 stats and 10 spots is to much, make it 3 stats and 5 deposit spots lol . . ..
make bank for what? the last 10 minutes of dmm ? im assuming among the protected items will be a huge cash pile of all the servers collected money no? Yeah, kind of have to agree. Xp rate/questing too slow for me. Good job team tho.